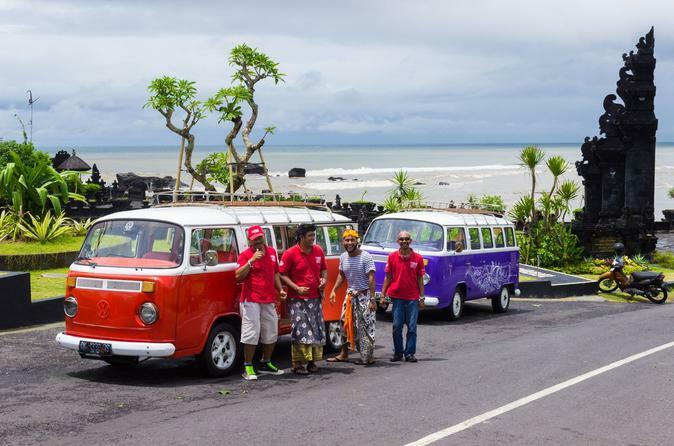 Go retro in Bali on a beach-and-bar-hopping tour in a classic 1980 VW Kombi bus. You’ll stop at Bali’s best beaches and seaside resorts in search of the next great cocktail (drinks are at your own expense). Along the way, your guide stops at a 17th-century fertility temple off the tourist track. This full-day adventure is limited to five people for a small-group experience. After pickup from select hotels, meet your driver, guide and small group as you hop aboard a 1980 VW Kombi equipped with Wi-Fi and a minibar. Your full-day Bali adventure begins with a visit to the club house at remote Batu Belig Beach for some stellar tropical drinks. Your guide can recommend specialties such as the Delinger (a blend of vodka, strawberries and ginger sorbet) or a dish from the menu featuring French-Balinese cuisine. Back aboard the VW bus, you’re driven through nearby beach villages as you head toward the 17th-century temple of Pura Batu Ngaus. Learn how the Balinese come here to seek medicine or fertility blessings from the mangku, or priest, and leave offerings through a blowhole in the rock that connects to the ocean via an underwater cave. En route, you’ll pass scenes of government-protected rice terraces and catch glimpses of the sea and the far-off cliffs of Uluwatu — keep your camera at the ready for those classic Bali shots. For more stunning views, laze around a boutique art hotel with a restaurant and bar set on a large lawn overlooking the ocean. You can order tapas as you sip one of three sangria varieties (or try all three!) in the late afternoon sun. Leave the northern beaches behind and head south, passing small streets crammed with antiques and collectibles. Cross over to a fishing village that is home to Bali's largest seafood market. Stop at one of Bali’s best beach clubs to watch a sunset in Jimbaran Bay and try a vanilla-flavored margarita, foxtrot gimlet or frozen apple martini, among other tasty concoctions. Finish your Bali tour with a nightcap at the iconic Ku De Ta bar at Seminyak Beach, a long-standing hot spot that’s considered to be one of the best beach clubs in Southeast Asia. An espresso martini may be the perfect drink for revving you up for a night out on the town after your tour, which ends here. Please note: All food and alcoholic drinks, including those from the minibar, are at your own expense.